So back to my problem i posted last week. Meanwhile i updated EFA to version 3.0.2.6 + CLAMAV 0.100.2-1.el6 according to henk's post here. 1 file scanned in 6 seconds. Should i be worried about that ? I noticed some differences in the mailscanner output. Did you modify filename rules? Just compare the first part. No white or blacklists or even configuration files? Don't use salt on the open wounds.... ...Netherlands in the Final Four - who would have thought it a few months ago ? Did you modify filename rules? Yes, i modified filename.rules.conf - the first section are the filetypes that are allowed (only a few: rar, zip, jpg, dwg, pdf.... and so on) - the remaining filetypes are all blocked (deny) - no exception. I allowed \.com$ + .\exe$ in filename.rules.conf - same result as above. I have no clue why MailScanner --lint fails - but clamd and sophos are working as expected. Why do you use greylisting when using fetchmail? And do you whitelist / trust localhost? #              talking to the MailScanner server. This is the normal setting. # yes or 1 ==> use the first IP address contained in the first "Received:"
#              header at the top of the email message's headers. # mail actually came from. Last edited by henk on 20 Nov 2018 12:07, edited 2 times in total. One day we get a real mailserver like Exchange and not the crap we use now - Tobit David. Therefore i decided to use an e-mail filtering applliance like EFA in case we change the MX records for our domain pointing to EFA. Actually all postboxes are hosted by our provider and i get the POP3 postboxes via fetchmail. That's why greylisting is running - when i change the configuration i don't will forget that i have disabled greylisting. All that can't be the reason why MailScanner --lint does this output, or ? I use the same method for several providers an it works fine without Exchange. As I do not use greylisting I still miss the clue why using it with fetchmail, since the sending mailserver is your provider, hosting the mailboxes. In my view it's the same when you use fetchmail and Postfix restrictions, for example unkown domains. By doing so fetchmail will leave the message from a unknown domain on the providers mailbox and the next time fetchmail runs, the same message wil be there again, and again and again.. So please explain what do I miss on this one. i'm a bit lazy about disabling greylisting, you are right. pop3 -> fetchmail -> efa -> greylisting (5 mins for unkown) -> efa -> mailscanner -> smtp to Tobit David. 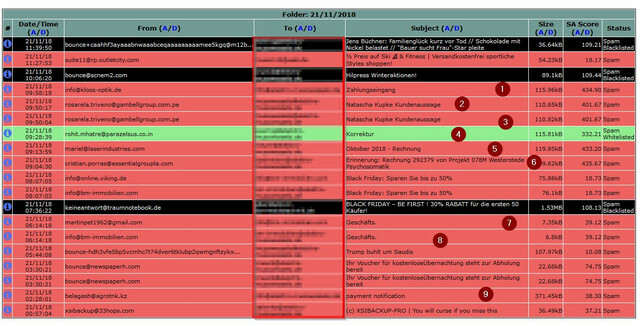 By doing so fetchmail will leave the message from a unknown domain on the providers mailbox and the next time fetchmail runs, the same message wil be there again, and again and again.. Disagree ...fetchmail takes the mail, flushes the pop3 mailbox at the provider and takes the way i write above. If we get an Exchange, i have to point the mx record to the EFAMachine and disable only the fetchmail daemon - that's it. Since 2 weeks we are flooded with fake e-mails with attached word documents containg trojans. None of the virus scanner recognize the OLE Macros - i catch them in quarantine only with the spamassassin plugins RelayCountry and OLE Macro. 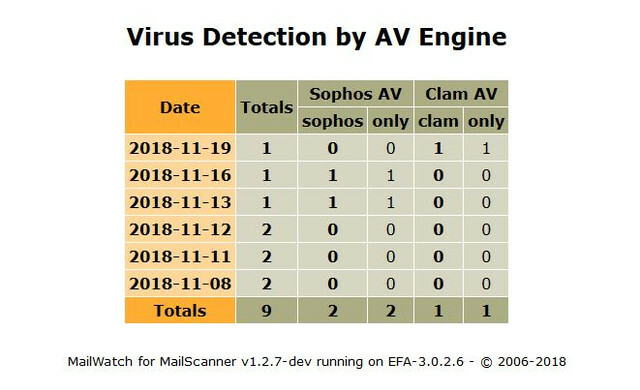 We use Clamav + Sophos on EFA, the File Servers have Kaspersky Endpoint Security. Is it in Netherlands too ? I liked the idea someone uses the same fetchmail method with E.F.A. There is a long list of advantages and a short list disadvantages. About the disagree, when running fetchmail, if postfix rejects a message due some restriction, the specific message is not flushed on the providers mailbox. Free free to test it and get prepared for a very busy E.F.A. server, fetching the same rejected mails for every fetchmail run. Versus the risk to lose mail. Thats the reason I need to classify bad mail as spam and do something with it. The best thing would be to open a new post with the trojan story. There a many members on this forum with great skils. Maybe somebody has ideas how to solve this. "Sie sind in gutem Deutsch verfasst" As reading/understanding German is easy, writing proper German is something different for the non Germans. I would follow the advise given as "Antiviren-Software schützt derzeit nicht ausreichend vor dieser Gefahr." Und "Am besten schützt man sich, indem man keine Office-Dateien öffnet, die einen via Mail erreichen. Und auf gar keinen Fall sollte man der Aktivierung der Makros zustimmen – auch wenn es noch so plausibel erscheint." As the Netherlands is a very small country, it's very difficult to find, even for the Dutch themselves. On top of that we have 17 million experts on a population of 17 million. Did I mention the Dutch language? We need to ask the Belgians how to write and speak proper Dutch. My rules - i use all blacklists avaiable in MailScanner (SPAMCOP/SPAMHAUS/SORBS/BARRACUDA) and iXhash (http://www.ixhash.net/) with default values and Plugin RelayCountryBad (https://wiki.apache.org/spamassassin/RelayCountryPlugin). RelayCountryBad adds 30 points to the score except all countries from EU (not all ). We don't have customers outside of germany, but distributors outside Germany. OLEMacro = 200 points -> messages goes in quarantine regardingless of other rules like whitelist etc. Mails with positive virus scans will be deleted. oha, i thought the netherlanders and belgians are not friends, and the dutchmen think of the belgians like the little unloved brother.